With respect to Machiavelli’s thought, the important facts about the first Italian War are these. Until 1494 Italian politicians occupied themselves with domestic power struggles among the 5 power centers: Milan, Venice, Florence, the Papacy, and Naples. The peninsula had been largely peaceful since the status quo established after the War of the Milanese Succession by the Peace of Lodi (1454), which established a precarious peace based on a balance-of-power mechanism. The Medici (Cosimo, Piero, and Lorenzo) had worked diligently to maintain the balance and especially the coalition of Milan, Florence, and Naples. Politics lost the guiding hand of the Medici when Lorenzo died in 1492. Conflicts between Milan and Naples, which had always threatened the coalition became acute when Lorenzo’s son Piero (the fatuous) took sides with Naples. The threat from Naples caused the ruler of Milan, Ludovico Sforza, to attempt to counter it by encouraging the young king of France (Charles VIII) to press his long-dormant dynastic claim to Naples and more importantly, to offer him military and logistical support. Ludovico was not the only force behind the French invasion plans. Charles also found encouragement in the lobbying efforts of Cardinal Giuliano della Rovere (later Pope Julius II) who encouraged the venture as a means of undermining his rival, the Borgia Pope Alexander VI. The prime cause of the invasion was probably a combination of historical forces and Charles himself. France was coalescing into its modern form as the monarchy acquired formerly independent French-speaking territories. In particular, when Charles’s father (Louis XI) gained Anjou in 1481 the Angevin claim to Naples came with it. Moreover, the acquisition of Province, gave France a long Mediterranean coastline that made it a Mediterranean power. Thus the claim to Naples fell to a power with the means to enforce it. However, Charles Italian adventure also demonstrated the point (which is Machiavelli’s main concern in the first 11 chapters) that holding a territory is much more difficult than its conquest. Indeed, France was quickly driven out of Italy by a coalition of Italian and outside powers, led by Pope Alexander VI (Borgia). The outside powers included Ferdinand II of Aragon and king of Sicily and Maximilian I (Habsburg), Holy Roman Emperor. 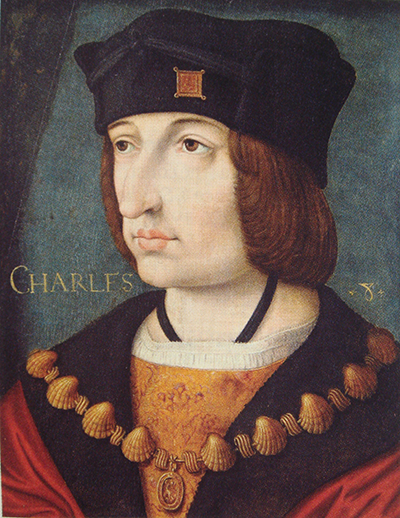 Maximilian’s grandson, Charles V, would become the most powerful monarch in Europe, ruling the Holy Roman Empire, the Spanish Empire, and much of Italy. Charles invasion had little lasting impact, except in Florence, where it caused the overthrow of the Medici and the founding of the republic in which Machiavelli served.